I finally found it! (Online, at least) The last Marvel Cinematic Universe 10th Anniversary Legends set that I needed: the original ‘Iron Man’ pack that includes Tony Stark and Iron Man Mark 1. I went into this MCU First Ten Years Collection swearing up and down to myself that I would skip a few box sets and save myself some money. All of the good intentions in the world couldn’t stop me, I still ended up owning every last one. Even the unnumbered ones that were announced after the initial ten. First Hasbro, don’t think that I didn’t notice you strategically placed Mark 1 higher up in the plastic tray to give off the illusion of height. Don’t be fooled by their trickery, this is the same undersized figure from the first Iron Man movie toy run almost 10 years ago. Toy Fair magazine was still a thing when this toy debuted. I remember that Hasbro got a cover spread for the new ‘Iron Man’ movie line. Back during the dark years for Hasbro’s Marvel Legends line. So let’s dig a bit deeper into Mark 1. If you were collecting Marvel Legends back in 2008 this was an okay at best figure for the time. Releasing it today feels like a gigantic step backwards. It’s undersized and the articulation is close to useless. I’ll give it credit for having a nice sculpt, and the new paint job is very sharp. But that is where the praise ends. Being an almost 10-year-old mold, it even includes the projectile launcher action feature on his left arm. At the very least, when Ares was rereleased they redid his ankles. Nothing was touched up here, articulation wise or sculpt-wise. Being that the set’s MSRP is $50, you are essentially paying $25 for Mark 1. Oh right, and you are paying another $25 for a Coulson body with a Tony Stark head on it. If I’m being honest with myself, I just paid $50 for Tony. Tony Stark is fine. He’s actually better than fine. The Coulson body works great and the face printing is pretty crisp. However, for all of the reuse in this box set, it wouldn’t have hurt to maybe include a second head with shades on. A head, hands, a cell phone? I want to feel like I get some value out of this purchase! It is possible to put the Stark head on Mark 1, but I really wouldn’t suggest it. First off, it doesn’t even look that great. Second, the ball joint on Mark 1 is bigger than the receiving hole in the neck. So you’ll end up stretching the plastic and the head will sit loosely on the suited body. 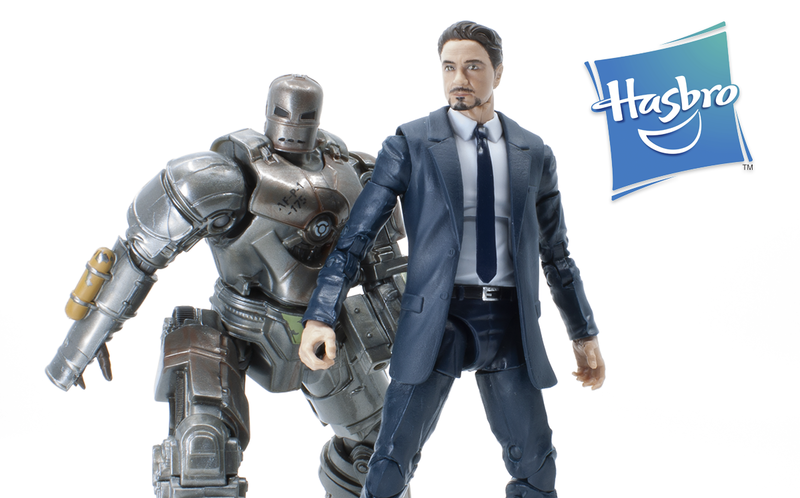 Would I suggest Hasbro’s Marvel Legends MCU 10th Anniversary Tony Stark & Iron Man Mark 1? This is one of the rare occasions where I have to say no. Wait for a sale or some type of discount if you really want Tony. The Mark 1 is not a good figure. It’s a relic of the past that should have stayed there. Had Hasbro actually went back and made a properly scaled Mark 1 with a better articulation scheme, I would have been willing to pay the upwards of $75 for this set. Instead, the way it is I believe the $50 price tag is asking too much. As I mentioned before, the Tony figure is good and it’s about damn time that we got a solid face-printed Tony Stark head. But the package’s asking price is a whole lot for what amounts to a new head. Of all the 10th Anniversary sets released so far, this one is probably the weakest. It really is a shame too because an updated Mark 1 would be a great toy to add to the collection. This set is exclusive to Walmart.